Extending the range of Argweld® purging products and providing an economical non metallic weld backing system for the backing of welds, where purging is required but not easily achieved. ARGWELD® ‘Backing-Tape’ has been designed to adhere to the backside of a weld to allow single-sided welding from the front. Typically for the welding of thin wall stainless steel sheet and vessels from one side only, the Backing-Tape can be attached to the backside of the weld to support the weld pool, keep the argon from the torch surrounding the weld pool, and eliminate the need to back-purge while giving a consistent high quality under bead profile. Backing-Tape offers tremendous savings of purge gas and waiting time particularly when welding large vessels. The heat resistant adhesive aluminum backing foil is 3” wide with a 1” woven glass fiber cloth strip in the middle. There are now many grades of Backing Tape that will support single pass TIG welding at weld currents up to 240 AMPS, without change to the chemistry or metallurgy of the weld. to achieve a flatter, smooth, coke free welding bead to minimize the need for post-weld grinding and cleaning. The Backing-Tape comprises a 75 mm wide, heat resistant aluminum sticky tape, in the center of which is a 25 mm wide band of woven glass fiber cloth. It is possible to weld onto the tape with MIG, Stick, TIG or plasma welding processes, so long as the recommended current levels are not exceeded. The lightweight grade comes in 25 meter lengths and the heavyweight in 12.5 meter lengths. 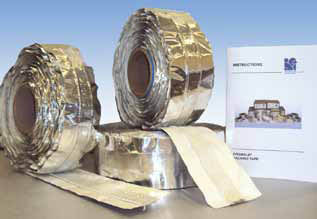 If lengths are needed to be joined, rolls of the sticky aluminum tape without the fiber are available from Huntingdon Fusion Techniques Limited, allowing a small length to be cut off to join two lengths of the ARGWELD® ‘Backing Tape’ together.